At Bluewater, we spend a lot of time speaking with individuals and training professionals on the power of self-reflection, the realizations of our behavioral blind spots and inspiring the action of going inward daily for self-care. In our incredibly busy personal and professional lives, it can be hard to separate ourselves from the “doing” of our work and focusing on personal and professional growing. When we speak to professionals about self-care and reflection, almost every conversation involves a discussion about how it is hard for people to move past the immediate fires and demands of having too many to-do items on their list to take the time to truly reflect. There is one exception, however, and it is not a positive one. I frequently hear how people replay their perceived mistakes, over and over again, often days and weeks after the situation happened. While self-reflection is a powerful tool to ensure we are learning and growing, just like anything else, extremes in either direction can do more harm than good. Remembering the negative can be a common experience in both our professional and personal lives. Even the most successful among us can find it hard to resist scrutinizing the things at which we have failed, as opposed to the good we have accomplished. This happens so often because our brains are hardwired to remember the bad and downplay the good. According to a New York Times article (Praise Is Fleeting, but Brickbats We Recall), “In an experiment in which participants gained or lost the same amount of money, for instance, the distress participants expressed over losing the money was greater than the joy that accompanied the gain.” And “In addition, bad events wear off more slowly than good ones.” While reflection on situations, conversations and decisions made can be a great way to aid in our growth and create better results in the future, dwelling on those things can stifle our productivity, make us miss opportunities for future success and also, make us really, really miserable. My solution: think like a hockey goalie. Growing up in Detroit, Michigan, hockey is a part of my blood. We watched hockey, played hockey and talked about hockey. 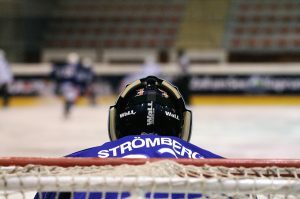 Most successful hockey goalies have an unexpected super power – the ability to forget. Being a goalie is all about being fully present in the moment to stop a three-inch puck traveling 90 miles per hour directly at them. Being able to quickly move past or “forget” the last puck they let in allows them to stay present in the current moment and is crucial to their success, and yours. Focusing on the past or what went wrong previously, takes us out of the moment we are in and steals our ability to be our best in the present moment. Certainly, reflection on what went wrong is important, but we have to make sure we are not letting past mistakes get in the way of future success. So do yourself a favor: live, learn and forget, like a goalie. Categories: Business Excellence, Professional Development, and Talent Management. Tags: bluewater, goalie, leadership, Professional Development, professionals, and success.